Earlier this year we received a number of reports from users that were unable to delete, move or rename documents on a new SMB file share. Eventually we were able to narrow it down enough to be able to consistently duplicate what they were seeing. It appears the SMB client in Mac OS X (10.11, 10.12 and possibly others) is overly aggressive with file locks. Here is a movie of the bug in action. Many of the Mac administrators we reached out to for confirmation claimed they didn’t see it, until they followed our steps. The bug seems specific to non-Apple SMB shares (we see it with Microsoft Server 2012r2), we can’t replicate it with OS X Server SMB shares. Turning on/off Finder previews has no effect. Our machines are not bound to Active Directory. We have confirmed with other institutions that have their clients and server bound to Active Directory and they see the same issue. We’ve notified Apple and Microsoft about the issue. We have been informed this is an Apple issue, but we have no timeline to share for a fix. We hope Mac OS 10.13 High Sierra will include it. For 10.13, can you try disabling FileIDs (in /etc/nsmb.conf ) until you can deploy macOS Mojave? Let us know if this works around the issue in High Sierra. I couldn’t reproduce this on a Synology share, so perhaps it is Microsoft Window Share specific. What version of macOS did you test? Can you share your SMB configuration on your Synology share? Synology NAS’s appears they could support multiple SMB versions and configurations. We didn’t test against Synology, but a Microsoft Server 2012r2 and Qumulo which is a scale-out NAS http://qumulo.com/. But, if you post details of your Synology model and SMB configuration I can add it onto the AppleCare Enterprise problem ticket. We have seen the same behavior on Nasuni (https://www.nasuni.com) caching servers. What we have found is that working in list view mode instead of column view mode seems to alleviate the problem. Not the ideal solution, but it does work. I know that our sys admins have opened this with Apple (I do not have radar info), and I believe Nasuni has also opened a bug with Apple. We will post more details, after we have done some more in-depth testing. I can confirm that I’m seeing this issue on a Windows Server 2016 file server. Clients are all Macs and are not AD bound. Also having permissions issues saving Photoshop documents (and in other apps too). I’m going to be testing High Sierra as soon as I possibly can. Let us know the status of your macOS High Sierra testing. We will test too and post back to the blog with details. Do you have the Apple Case # so that we can also run this up the chain via our Apple Engineer? Here is the Microsoft Case number: 115110913354757. I am working with AppleCare Enterprise to get the Bug Reporter # and will post back. Thanks Richard, I’ll be keeping a close on this thread. We haven’t been able to replicate the issue in macOS High Sierra GM. Have you testing macOS High Sierra GM? If you don’t have access, you should try to get it, but if not, try the final release and let us know your experience. We tested the bug with macOS High Sierra 10.13 and it appears to be fixed. We couldn’t replicate the issue. If you still are seeing the issue, please comment back with details on your SMB server configuration. I’ve just tested with High Sierra 10.13.0 version 17A365 and Windows Server 2016 and the issue seems to be resolved. Great, glad to hear it. Please post back if you have any other issues. Hi @ll with the final release of 10.13. I do have this same issue on my Synology RAID! Anyone found a solution to it? Can you share details about your Synology RAID? Like model/make and configuration. If you can share, I can ping AppleCare Enterprise about it. Have you contacted Synology technical support about the issue? We’ll need to know the model number, configuration and current firmware version of the Synology box. Note: “-s 0” includes a zero, not the letter O. When prompted for a password, enter the one for your administrator account. I appreciate that I’m late to looking at this issue. I cannot replicate the issue using macOS 10.2.6 with a Windows 2008 R2 SMB share. However, I have seen issues like this before, which are usually linked to Windows permissions. The main culprit is ‘Creator Owner’, which is a massive NO NO for working with macOS. Thanks for the feedback & best practices advice, but the issue was confirmed by Apple and supposedly fixed in macOS High Sierra. With ours and others testing, it appears it is fixed. I am encountering this same issue on High Sierra (10.13). We are using a Synology RAID (Model RS18016xs+ / DSM 6.1.3-15152 Update 4 / INTEL Xeon E3-1230 v2 3.3Ghz). Any help/advice on this would be greatly appreciated. Thank you! Thanks for the feedback. I will forward the configuration information to Apple Enterprise support. Have you tried contacting Synology technical support about it? 1. Does terminal work when Finder fails? 2. What about a 3rd party Finder alternative, such as Pathfinder? 3. Did Synology offer any advice? You can delete the /etc/nsmb.conf file to revert to standard behavior. Hi Richard. Really great stuff you have here. I am able to reproduce this bug on MacOSX 10.13 High Sierra on a Synology DSM416 running DSM 6.1.4-15217. I have submitted a support ticket with Synology yesterday and am still waiting to hear back. I did try that last step in the comment reply to Paul Major, but have not tried terminal or a 3rd party finder alternative. For terminal, do you want all of the folder operations (creating folder A/B/C, etc) done through terminal or just the renaming step? I also have a .pcap file from the operation but I haven’t been able to properly parse it yet. Thanks again for the super detailed explanation and reproduction steps. Thanks for the reply, yes if you can following the folder operations creating folder A/B/C, etc) needs to be done in Finder as this is a primarily a Finder bug. Are you seeing the issue just using Terminal on macOS? I have the same problem on my EMC fileserver. Thanks for sharing, can you share configuration and specifications? Issues only with Finder or macOS terminal too? Having issues after migrating to Server 2016. 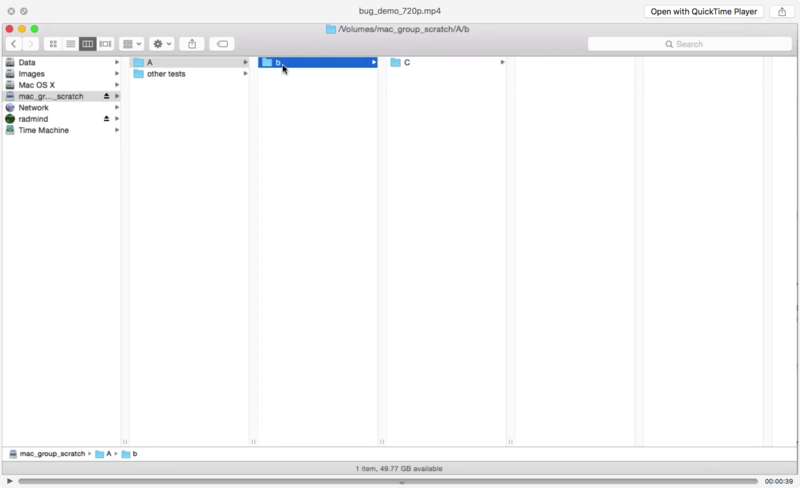 Can create files from Mac, but can’t delete it off the server from Mac or even Windows. I would recommend checking the accounts/groups permissions that were used to create the files. What version of macOS? This doesn’t sound like the bug mentioned in the blog post, but a permissions issue with your server. Updating to High Sierra and removing NTFS owner permissions resolved the issues. User only have modify now. Was also having issues save as from Adobe. Would save it as a hidden file. Sorry, so the issue is resolved? If so, great. If not, can you post back with more details and explain? I’d like some more info as well, if this has fixed the problem for you. When you say your removed NTFS owner permissions, do you mean that you changed all users to only have “Modify” permissions instead of “Full Control”? Hello, We’ve also been having the same issues. Renaming files, Moving files, etc.. and are currently running on High Sierra. It was the same on all previous versions. We run on an smb server and have tried ntfs servers as well and same issue. Also, have issues using adobe illustrator, saving a file. Then if I go into the file and modify it, save it. Go back into it, the second save session will not be saved and in fact shows as the original. The only fix i found for this was to do a save as every time and save over the previous versions. The big issue for us though is the file renaming and password required, enter the password, and still will not let us rename. It gets to the point we have to create a new folder and drag everything into the properly named new folder…then delete the unwanted version. It’s irritating. Any fix yet? Are you seeing this issue with applications that officially support opening/saving to network shares? Like non-Adobe applications? Adobe recommends saving files to a local disk vs network share. Previously we where using Microsoft SharePoint for document storage and used Transmit, which would cache the file locally and then open it and allow editing and then re-upload it to the file share automatically on save. Not ideal, but maybe a workaround for your environment. Hello Richard, Yes it’s other formats as well, essentially everything I save. Folders, etc.. as well. I’ve tried doing saves locally and then moving them to where they need to be on the shared drives when complete, and get the same errors. Can you share details about your SMB file server configuration specifics and notable settings that you are using with your mac systems clients? Thanks for the feedback. What version of macOS are you running? The fix is specific to the operating system bug, is only included with macOS High Sierra. Still ask for admin password, or it will not also allow you to delete/save on the server. Can you provide details of server you are using with the client. I’m still seeing this issue with macOS High Sierra 10.13.1 and 10.13.2 – it did look like it was initially fixed in 10.13, and the issue was definitely better, however now with more heavy use and newer updates, we’re back where we were before. The server is Windows Server 2016. Even on a small network (10-20 workstations) there will often be thousands and thousands of open files, all open in Read mode. These files opened in Read only mode are not an issue on a server running a Unix-type operating system. Unix is able to move, rename and delete files that are opened with a read-only file handle. We also see some files that are opened with Write + Read access – this is to be expected when people are working off the server. It’s the thousands of Read only file handles that’s causing these problems. If we then select the open files and force them to close on the server, everything starts working again (until the open files build up and build up). Let me forward that information to our AppleCare Enterprise problem ticket and I will let you know what Apple responds. Thanks for the information. Thanks Richard – it’s frustrating that Apple are pretty much EOLing macOS Server (basically turning it into Profile Manager.app) and yet we have so many issues working with 3rd party server platforms. I’m more than happy to gather additional information as required. Ok, np. I will let you know what additional data they request. If you are on MacAdmin slack, can you send me a direct message. I will need you to provide more details. We are again running a WS 2016 SMB3 fileserver for our mac clients in production. 10.13.x was a non starter even when attempting to edit /etc/nsmb.conf with suggested fixes. We are moving toward all endpoints to be 10.14.3 (or latest). The previous folder lockout issue appears to be resolved on 10.14.x. Have observed through windows open file utility that when a user traverses into a directory the directory considered locked but when they back out it indeed unlocks right away thus allowing folder naming and deleting capability. There are a few issues with Finder still but there are simple workarounds e.g. disable column view preview window as the server considers the preview file an open file so it locks the file when a user has it simply highlighted…fairly easy solve although it takes away functionality somewhat. The last major holdout is files are held once closed for ~20 minutes. Ive tested this by using spacebar preview and observing server side the file unlocked after this amount of time. Id say this is a bug. It appears there are some adjustments to be made client side for windows clients but none of this exists to my knowledge for mac clients. Unless there is a specific nsmb.conf setting to which Im not aware. The first thing that I would suggest is the steps to “Disable directory caching” in this kbase article. This may also affect the behavior you are describing with column view, so if it does resolve the file locking behavior you may want to test that as well. If this does not resolve the issue, please send me what steps you take to reproduce this and the behavior seen on the second client with the locked files.